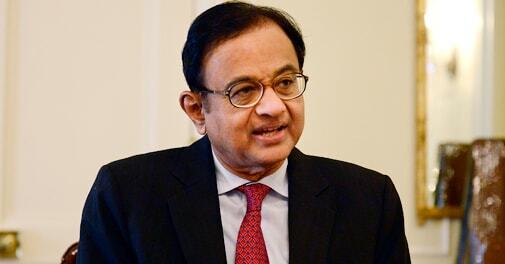 Was Chidambaram's growth projection in interim Budget too rosy? Was Finance Minister P. Chidambaram's growth projection in his latest Budget too rosy? The evidence of the last two years seems to suggest so. By any measure, Finance Minister P. Chidambaram can be called an optimist. Last month when he presented the interim Budget of the United Progressive Alliance (UPA) government, he not only praised his government for its past performance, but also painted a rosy picture for the future. However, the estimates he has given on several fronts - gross domestic product (GDP) growth, tax revenues and more - key components of the rosy picture he painted, are now being increasingly regarded with suspicion. For a start, doubts about Chidambaram's projections come from the downward revision of growth estimates in recent years. The advance GDP growth estimate for 2012/13, for instance, was five per cent, but the first revised estimate brought the figure down by 50 basis points to 4.5 per cent. The year before that, 2011/12, saw the GDP estimate being revised twice both times lower than the advance estimate. "The downward revision of GDP estimates is a reason to worry. It seems the speed of (economic) recovery was overstated," says D.K. Joshi, Chief Economist at ratings agency Crisil. Other economists are equally sceptical about the finance minister's advance estimate of GDP which, for 2013/14, has been pegged at 4.9 per cent. Discussing the future, Shubhada Rao, Chief Economist at YES Bank, adds: "Assumptions on growth in tax collections and GDP are optimistic and may not eventually pan out. We expect GDP growth in 2014/15 to remain in the range of 5.2 to 5.6 per cent as recovery in real growth is very likely to be moderate." Siddhartha Sanyal, Chief India Economist of Barclays, told Business Today soon after the Budget was announced that the ambitious target it had set for tax revenues would become a challenge for the government which takes over after the polls in April-May. "The tax collection projections are based on a GDP growth expectation of six per cent during the year, which is higher than our current estimates," he said. What are the implications of over-optimistic projections? They are several. Lower GDP growth than projected could make the job of the next government tougher. It is estimated that a percentage point change in (real) GDP growth results in a 1.6 per cent change in gross tax revenues. The next government will need to spend money on Plan and non-Plan expenditure. Nearly half its tax revenue could go into interest payment, debt servicing and subsidies, which is around 40 per cent of total expenditure. Experts say growth in the next financial year will depend on three factors: the extent to which the global economy recovers, the quality of this year's monsoon and developments on the domestic front. "If the growth estimates of P. Chidambaram cannot be achieved, it will have multiple implications on the fiscal side, corporate profits and consumer demand," says Crisil's Joshi. Chidambaram, in February confidently asserted that GDP growth for the entire year of 2013/14 would be five per cent. For nine months of the year, the April-December period, GDP growth has been 4.6 per cent. The advance estimate of the Central Statistics Office pegs GDP growth at 4.9 per cent for 2013/14. A rough calculation shows that in the last quarter of 2013/14 the economy will have to grow at 5.5 per cent if the whole year's GDP has to meet CSO's projection. The excise duty cut announced by Chidambaram in the interim Budget will also impact tax collections. It remains to be seen whether the new government continues with the cut. Already, tax revenues for the financial year 2013/14 have fallen below expectations by Rs 77,000 crore - from Rs 12.4 trillion in the Budget estimates to Rs 11.6 trillion in the revised estimates. Lower tax revenues could prompt the next government to make tough choices - perhaps even as drastic as revising tax rates upwards. Expand the tax base can be an option, too, but it could be challenging because of the poor compliance within the existing ecosystem. In fact, India's tax-GDP ratio is one of the lowest in the world. In 2007/08, it stood at 11.9 per cent before coming down to 10.8 per cent in 2008/09 and then to 9.7 per cent in 2009/10. In 2012/13, it moved up marginally to 10.2 per cent but continues to be far lower than the lower-middle income countries that have total tax-GDP ratio of 17.7 per cent. Even so, as experts point out, the latest Budget Chidambaram presented is an interim Budget and many of the assumptions will come up for fresh scrutiny when a new government takes office later this summer. "Getting into the practical details of the interim Budget is not necessary at the moment as the new government will make its own choices," points out YES Bank's Rao.